The Colonnade is a must see on your list. 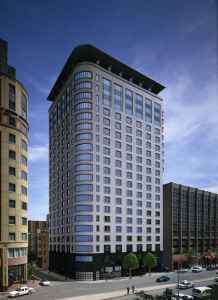 The Colonnade is a full service luxury rental building located in the Back Bay. This building is a doorman building catering to the discerning client. The Colonnade Residences offers the finest in luxury living with 24 hr concierge, elevator, state of the art fitness center, rooftop pool, storage...Truly the ultimate in city living. Gracious, Classy, Elegant and Sleek are just some of the words to describe this building located directly in the Heart of the Back Bay. Shopping mall and grocery stores are directly across the street. This 2 Bedroom, 2 Full Bathrooms is located on a high floor. A very spacious floor plan offering 1,230 sqft of comfortable living space. Meticulous Kitchens with custom cabinets, Mountain Gray Granite counters with ceramic tile back splashes, top o' the line GE Profile Stainless Steel Appliances, cabinet access lighting . Very spacious Bedrooms including Master Bedroom with private bath having Carrara Italian Marble Vanity's. Indoor parking is available as well as climate controlled storage rooms. There are NO Broker Fees while renting this unit through Linnane Real Estate. Living Area: 1230 Square. Ft.